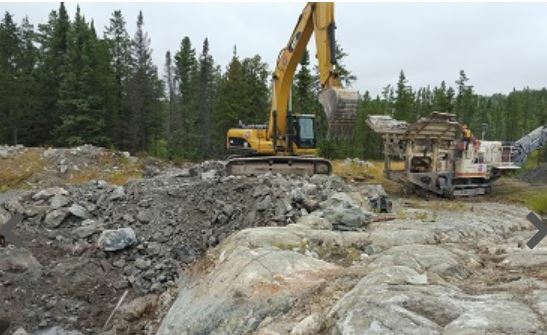 Bulk sampling at the Dumont nickel-cobalt project near Amos, Quebec. Source: RNC Minerals. RNC Minerals [RNX-TSX], aka Royal Nickel Corp., shares rose sharply again Monday September 24 after the company said a new exploration drive on 14 Level at its Beta Hunt Mine in Australia has recovered more visible coarse gold. The find provides further proof of concept that the structures containing the Father’s Day Vein discovery extend 200 metres (25 metres up-dip and 180 metres along strike] above the Father’s Day discovery area. Investors reacted to the announcement by sending RNC shares up 93% or $0.51 to $1.08, on volume of over 70 million, making it by far the most actively-traded stock on the Toronto Stock Exchange. The 52-week low is 7 cents. The find included a single 95-kilogram chunk that contained 2,400 ounces of gold, worth about $3.8 million. A second 62-kilogram stone contained 1,620 ounces. “I am thrilled to provide this update, which extends the sediment structures 200 metres from the Father’s Day Vein gold discovery in an area adjacent to existing mine infrastructure,” said RNC President and CEO Mark Selby. “I believe we have only scratched the surface of the high-grade gold potential from this sediment layer, which is a district-scale feature extending across the entire property,” he said.